Eye lid and lash hygiene is an important component in the treatment of both anterior blepharitis and posterior belpharitis. Eye lids and lashes can be washed with diluted baby shampoo or diluted soap. If soap is used, it is usually best to use soap that is hypo-allergenic or made for sensitive skin. Some people are especially sensitive to soaps, and may have to wash with just warm water, although washing with warm water is not as effective as washing with soap. Some doctors recommend applying warm compresses, before using soap or commercial cleansers, to loosen any debris that may have accumulated at the base of the lashes. Other doctors recommend using a clean washcloth or lint-free cloth, soaked in warm water, to gently scrub the base of the eyelashes. Gently scrubbing, for 15 seconds per eyelid, loosens any debris, and aids washing. The key is to scrub very gently, just enough to moisten the tissue and loosen debris. Some people may have sensitivities or allergies to both commercial products and the solutions they mix themselves. These individuals should not use eyelid scrubs, cleansers, or wipes. Trying the product on one eye first is best if there may be an allergy or sensitivity to the product. Several over-the-counter eyelid wipes and washes are available in drugs stores and online. Lid wipes usually come in single-use foil packets. Some cleansers may be left on, and others may be washed off. Follow your doctor’s recommended instructions. Hypochlorous acid is used in skin and wound care. It is produced by the body’s neutrophils to fight infections. 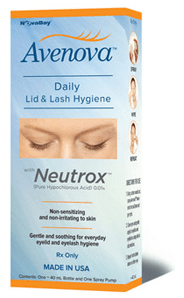 Avenova (formerly i-lid Cleanser) by NovaBay Pharma is a lid and lash cleanser available by prescription only. It was developed as a skin and wound cleanser, approved by the FDA to remove bacteria. It also has anti-viral and anti-toxin properties. Avenova contains isotonic saline and pure .01% hypochlorous acid (Neutrox). Avenova does not contain soaps or detergents. OCuSOFT® HypoChlor™ (Hypochlorous Acid 0.02%) Gel & Spray can be used to supplement its existing OCuSOFT Lid Scrub family of eyelid cleansers in the most severe cases. Heyedrate Lid and Lash Cleanser is a hypoallergenic diluted hypochlorous acid formula. It is alcohol and fragrance-free, and contains no parabens, sulfates, or preservatives. Lid hygiene solution can be made by diluting unscented soap, or baby shampoo, in water. The solution should be made with warm water at a 5:1 ratio of water to soap. A 20:1 ratio of water to soap can be tried if there are sensitivities or allergies to soap. A clean finger, or sterile cotton swab, is used to gently wash the eye lashes, paying particular attention to the base of the lashes where debris and bacteria can accumulate. It is important to rinse thoroughly. Sterile saline can be dripped onto sterile cotton swabs and used to gently wash the lashes. Saline solution is not as effective at cleaning as soap, or commercial wipes and cleansers. Saline solution can be drying.